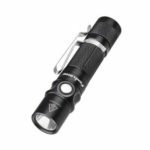 HP30R is a headlamp with separate battery case, powered by two 18650 Li-ion batteries. 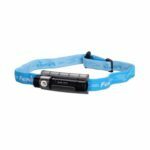 The belt-worn battery case reduces the load bearing of user’s head and maintains optimal performance in cold areas. 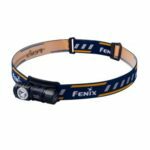 This headlamp is rechargeable via the Micro USB port in the battery case, and the battery can be used as a power bank. Featuring four white spotlight output levels, and four neutral white floodlight output levels, the spot- and floodlight can be switched on simultaneously to deliver a max output of 1750 lumens, runtime of 400 hours and a far-reaching beam of 202 meters. The HP30R will be an indispensable aid in your mountaineering, searching, snow-hiking or any other challenging outdoor activities. 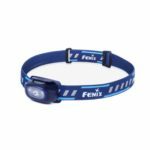 The Fenix HP30R helps users light up the night with a blazing 1750 lumen maximum output that illuminates a distance of up to 221 yards. 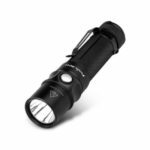 Includes a powerful far-reaching 1000 lumen spotlight which is ideal for searching and exploring. 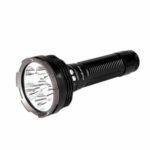 The addition of a 750 lumen neutral white flood light produces better color rendering and clearer vision at night which is great for reading, camping and photography. An industry first built-in Micro USB port makes charging 18650 batteries easy and convenient – no need for a battery holder. 2 18650 batteries, cable clip, top headband mount, spare o-ring, belt clip, USB charging cable, 2 cable buckles.